Moving on to another portion of the house, we come to this tropical shrub thing. 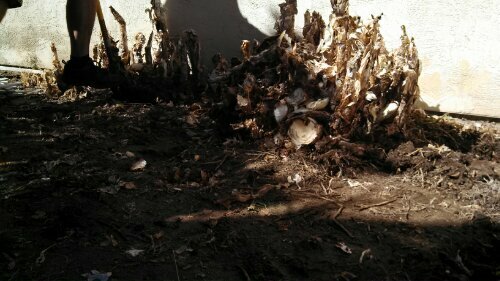 The foliage died during termite tenting, but it was starting to come back. I’m not sure what kind of plant it is– I believe it had orange red flowers that looked sort of like lilies, but were not lilies. Or maybe I’m thinking of the ones that were in front. The house came with quite a few tropical-climate plants, in front and back, scattered in three different areas. Anyway, tropical plants are lovely…except that we live in a desert. And we have a pool, which uses a ton of water all by itself. Not to mention three kids who constantly take showers and the laundry and dishes and everything. In San Diego, water rates are very expensive, and only going up. Plus, the sprinkler system is iffy– it already broke once while the previous owners lived here, flooding the house; and it broke again, if you’ll remember from my previous post. My father-in-law, a man with like 5 decades of house repairing and engineering experience, calls it “suspicious.” Now, my FIL does not like to spend money. He’s a man who will drive an ancient rattling car across the country and think nothing of it; or build a boat in his backyard and sail to Mexico in it; or MacGyver a piece of duct tape onto a lawnmower engine plane (maybe not that part); so if HE says something’s “suspicious,” we had better also regard it as suspicious. So we’re thinking we may not want to use the system at all. Which means I have to remember to hand-water the plants we keep. Replacing the water-hungry plants with plants requiring less water is a no-brainer. This plant is located in the partially shady side yard, where there’s an expanse of grass that lives pretty well with minimal water. It’s by the pool pump, which lately we’ve had to drain and clean– that’s probably why the grass does well. 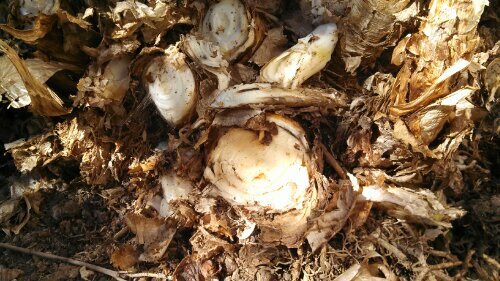 The plant has these sort of tubers, like giant onions or leeks, and a huge root system that was going under the house. Sticky glue-like stuff came out, too. It came out pretty easily. I started digging them out while Cadillac wasn’t home, and he arrived home and said, “Let me get in there,” and dug out the rest. MY PLAN WORKED! See, all I have to do is start a project; then Cadillac’s OCD and Catholic guilt takes over and he worries that I’ll get hurt or won’t do it right or feels bad for not doing it. Which is what happens when I find him cooking– I get in there and take over– so everything’s kind of equal. ← Who Do You Think You Are, Calling Yourself a Novelist? 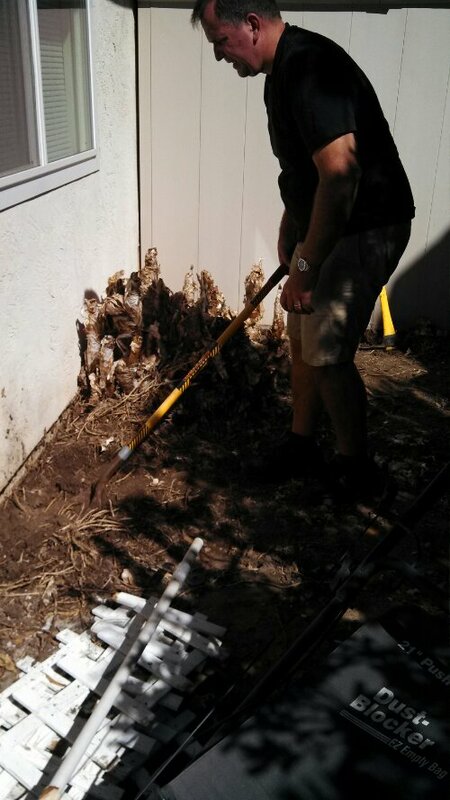 I was happy to trim our bottle brush tree from hanging onto the house last summer, to keep rats off the roof. My husband came out and said he would take over…. Ended up cutting off so much that there was more on the ground than on the tree! Sadly, he said this would be a good project for him and the boys to slowly saw up and put in The green bin every other week. 2 years later, they are almost done. Pretty sad. I would have have had it done in a week or two. Men! The tree looked really really ugly, too! !